This review will cover the current “Arrowverse” seasons including: Arrow (season 6), The Flash (season 4), Supergirl (season 3), Legends of Tomorrow (season 3), & Black Lightning (season 1). This excludes the crossover episode that I reviewed a few months back, but focuses on the main series’ separate story arcs. Arrow this season had quite a few high points, and very little low. High points are Ricardo Diaz (Richard Dragon), the breakup of team Arrow, Ollie’s solo crusade, Detective Lance’s goal to turn Black Siren into someone more like his Laurel, Black Siren’s story arc, Oliver as a father, Diggle becoming an Argus agent, Rene being more like a father and his emotional side, Christopher Chance as the Human Target, and the pace of the season leading up to an explosive and shocking finale with some really great decisions albeit heartbreaking ones. The parts of this season that didn’t work… Everyone complaining about Oliver as the Green Arrow. His decisions might not all have been perfect, but the man’s crusade has definitely been for the greater good. Oliver and Felicity getting married. Just stop already. It’s annoying, and she works better as a separate entity not with him. Also are we just supposed to believe she will jump in and play mommy role to Oliver’s son? I guess so. Two Black Canary type figures. They need to decide who to get rid of because it’s too much. Make the new Laurel what the old was supposed to be, and it’ll work better. And finally, Mister Terrific. He’s so clichéd at this point its not even enjoyable to watch him. He barely has a role other than to fill in the gay guy part, and that is over played in bad taste. All in all, I give the season 4 out of 5 sCrypt ratings. The Flash like arrow this season was overall enjoyable. The good parts of the show were the mystery girl who turned out to be Iris and Barry’s daughter from the future. It was short but kept me wondering. Ralph Dibney (Elongated Man) as an addition to the team is far more enjoyable than some of the other members. He adds a new personality that differs from the rest of the cast making him a breath of fresh air. The Mad Thinker as the villain worked in so many ways and finally gave us someone who wasn’t a speedster. Here’s what didn’t work… The whole Killer Frost thing. It felt very forced as if they just didn’t know whether to choose to keep her as a hero and piss everyone off or have her stone cold villain and lose their precious Kaitlyn. Get over it already and do the thing actual comic fans want. Iris as team leader is just stupid and takes away from that character. H.R. was great as usual, but there were times where I felt he just didn’t fit into the story. I give this season 4 out of 5 sCrypt ratings for the fact that they finally did something different, and didn’t get too involved in controversial things. Legends of Tomorrow was better than its previous seasons but I still wonder why it’s on. It began strong with me thinking they were going to address how they have no concept of time travel and how it logically would work, but they scrapped that right after the first episode and went back to pure garbage. If anything at this point they shouldn’t even exist in the same reality as the other shows because they’ve screwed things up from their actions… but that is all ignored by lazy story telling. The writers only care to push their agendas from anti-Trump nonsense to shoving lesbian plots into places where a relationship doesn’t work no matter what the character’s orientation. As a man who is very middle ground, open minded to all, and offended at any extreme left or right political push, this bothers me a lot. It’s to the point where a guy who has loved comics from when he was a kid can’t even get away from this real life problem by watching a show that’s supposed to be enjoyable. One good thing they did was to bring Constantine in for a few episodes, and give Wally West a role that is much better suited than on The Flash. I give Legends 1 out of 5 sCrypt ratings. Supergirl is slightly better now that they’ve focused less on relationships and more on story. My problem with this season is that it fell flat with the rip off Smallville Doomsday plot. They just keep reusing Superman’s villains or doing a new take. It’s not even creative at this point. What saved the show this year was the introduction of the Legion, and having Martian Manhunter’s father losing his memory. That is something that connects with all viewers and not just a certain crowd. Supergirl was overly hard to watch though because it focuses less on the main character and more on her supporting ones. I give it 1 out of 5 sCrypt ratings. Black Lightning is the new addition to the universe, but he’s not much more than a wannabe Luke Cage. Sure, the characters are different, but the theme of the show goes for that feel. Here’s where it shines… The actors are all very excellent in their roles and Tobias Whale is a great villain. Where it falls is everywhere else. The political things that I’ve mentioned earlier go even more here to the point of making it seem like every cop is bad, most people are racist, and in order to stand up for what we believe we should condone violent protests. It’s just downright appalling to me that the writers really think this is okay. Touching on a subject is fine, but making it something for you to spread your message is not entertaining by any means. Black Lightning is a little bit better than the other two shows, but not by much. I give it 2 out of 5 sCrypt ratings. In Conclusion I must admit that I don’t know if I’ll be watching the last three shows mentioned next season. I’ve almost given up on Arrow a few times, but it reels me back in. The Flash is stale at times, but has interesting rogues. These others though are just a platform for close minded liberal attacks on anyone who doesn’t agree with them. I mean who are they gearing this toward? I honestly think that they believe everyone needs to think like they do or F%#$ off. From a man who is open to all beliefs and people, who is also a comic book nerd from youth, people like me should be one of the target audiences. Sadly we are not. In fact I’m sure most people can’t even stomach watching it even when we agree (and yes there were times when I agreed). It just shouldn’t be what it is and they’ve taken a great idea and universe and made it painful to watch. Even worse is that I just don’t care about it any more. I have seen how many people have just stopped watching these things, and now I know why. For what might be my last review of these shows with writers who have no concept of how entertainment works, I give the whole DCTVCWverse this season a 2.5 out of 5 sCrypt ratings. What did you think? Feel free to comment below whether you agree or disagree. When watching any of the CW DC comics shows you have to keep in mind the network that they are on. The writers are targeting a single market, and alienating others. People who have been fans of the comics and these characters for years (myself included) will often cringe at some of the decisions made by the writers. Children that should be able to watch a comic book show just simply can’t because they are all too adult oriented. And if you’ve got a political view that isn’t what the writers want to push, then you’ll be dissatisfied as well. These are shows aimed at millennials, and I’m not using that in a negative term towards that generation. I get a network wanting to appeal to a certain audience, but as a man who went to school for learning how to gain an audience, I know it isn’t a wise decision to exclude any others. If I were making a show I’d want it to reach as many people as possible (especially the long time fans and the next generation of youth). Sadly, this isn’t the case with Supergirl, Arrow, Flash, and Legends of Tomorrow. Anyone who has been following me for a while knows that I follow and watch these shows each week. Do I do it because they are great? No. But there is a small element that gives me hope I will eventually see what I know the DC comics shows could be. After this crossover it could go either way. Stay with me a moment while I explain. When Supergirl was in its freshman season it was lacking a budget, but the stories were told well. Then it was moved to the CW, and it became something entirely different. It got rid of good characters and changed the sexuality of another. It went from focusing on Kara Zor-El of Krypton to focusing on love lives. This wouldn’t be a bad thing if it was done right, but the problem is none of the dialogue in the relationships is realistic, and the scenarios feel forced if not acted out. I preface with that because that is EXACTLY what we got in this crossover. Now, I’m not entirely hating because there were good things about it. For example: The Nazi Earth storyline, the death of beloved character Martin Stein, the return of Red Tornado, Barry and Iris finally getting married, and some pretty fun action scenes to watch with all the shows’ characters coming together in a Justice League B-Team sort of way. Plot hole 1, 2, and 3: If Nazis won World War II and ruled another Earth, then why is the sky Red there? It’s still Earth right? And to add to that history would have been entirely changed. There’s a good chance that Oliver Queen wouldn’t even exist. Even IF that was possible how would he have become the Fuhrer? Is he a descendant of some high ranking German officer? That wouldn’t make sense either considering his family’s legacy. Not to mention that all existing character dopplegangers should have looked much different, whether it be facial hair, lipstick or whatever. Something would be different. Plot hole 4: The Nazis have a wave rider. Why wouldn’t they use it to travel back in time on Earth One and change things? Instead they use it to attack civilians running in panic. It’s instead portrayed as less a doomsday weapon that Overgirl was. Plot hole 5: Overgirl or Nazi Supergirl exploding also made no sense. The yellow sun powers her and Supergirl. Why would flying close to it irradiate her heart and cause her to be dying? Is this a lost plotline from Superman IV: The Quest For Peace? Even that movie had less plot holes. Plot hole 6: How did this Nazi army do anything to stay in power. It seems that they aren’t very loyal to taking commands. When their Fuhrer says, “Kill them,” multiple times, they just march forward. They have automatic weapons in their hands. All they had to do to listen to orders was to aim and fire. Sure, there would have been some bullet proof people or those who could avoid the barrage of projectiles, but the Nazis would have at least tried. And they would have succeeded in killing a few. Instead we get a group fist fight with little to no guns being used, but lots of superpowers. Plot hole 7: If Earth One is the Ray’s real home and Earth X is Citizen Cold’s real home, then why would Cold stay on One, and Ray return to X? Relationship aside, this makes no sense whatsoever. Plot hole 8: Why is Thawne on Earth X? And to top it off, why is he even taking orders? He could easily kill evil Oliver, and outrun Supergirl to other worlds. This just seems stupid. Plot hole 9, 10 & 11: These are less plot holes and more of unanswered issues, but who was the girl holding the drinks at the wedding? She acted like she knew Barry and is obviously someone from the future, but who? This doesn’t fit in a crossover episode, but should have been in a Flash episode. We have no answer at the conclusion of this arc though and are left wondering. Red Tornado’s return was much better than he appeared before, but are him and Metallo now dead? They both exploded as if they were just henchmen, and I’m still left wanting more of both for Supergirl or whatever show they fit in. Martin Stein’s death leaves another unanswered thing in his wake. Will Jax be useless from now on? My guess is that Stein’s daughter will be able to bond with Jax because of genetic code, and I’d be fine with that. There is a down side to this… it will become yet another relationship to watch on these shows. That takes us to the relationship part of all of this… Straight or gay it doesn’t matter… the way they were written in felt forced and didn’t make anyone care at all for them. In fact, the only relationship that anyone should care about in this crossover is disrespected. Relationship 1: Nazi Oliver and Nazi Supergirl – I actually enjoyed this one. It was as much a shock as it was to see Tommy Merlin appear as Prometheus, and it was executed quite well. The only down side is that this chemistry feels off for a so called dictator and a goddess of another world. It weakens their status and while they can and should love each other no matter how evil, it is something that would be done in private, not in public. Relationship 2: Alex and White Canary – Let’s take the whiniest indecisive character (Alex) and focus more on her fake love life. They spent a season of Supergirl making me hate this character and it wasn’t because she was gay, but because her love life didn’t seem authentic. Everything with her and Maggie was forced from bad dialogue to interactions. So it’s not a surprise when it carries over to hear, and even the characters feel funny about it in the show. Then they put her with White Canary, who at this point must have every STD in the history of mankind. How many women has she slept with throughout history and NOT affected the time line? It’s been way too many to count or make sense. This was my final straw for both these characters, especially Alex. They need to kill her off already because she brings nothing to the show. White Canary is fine when she is acting like a leader, but how disrespectful can you be at a friend’s wedding rehearsal to just ignore the bride and groom because you want a one night stand? ugh. Relationship 3: Barry and Iris – Poor Barry and Iris. This is one relationship I really care about. I want to see them together, and when they get their chance at a wedding it is all about everyone else and not them (including the point where they get married finally). Thankfully they had their moment, but the writers royally screwed them in the process. It’s a slap in the face to the actors and characters. Relationship 4: Oliver and Felicity – WTF?! Any respect I had for Felicity is gone after that crap she pulled. Some best friends you are if you can’t even respect their wedding. But no… instead of Green Arrow and Black Canary we get Ollicity… a forced and unsteady relationship that just shows why many marriages end up in divorce. They have no respect for what should matter (the wedding of their friends). Relationship 5: The Ray and Citizen Cold – I get that the Ray is a gay character. I get that the actor playing Captain Cold is gay as well. What I don’t get is why we had to see this portrayed so forcibly. Put all the sexuality aside and it really doesn’t make sense. Two people in love supposedly, but the one is in prison camp. The other finally shows up to help out? How long did that take? Then they kiss, and there is a drastic change in the mannerisms of Citizen Cold. He goes from being cool and badass to almost acted out like he’s prancing around and smiling all the time. I mean they quite literally stereotyped him right there and changed the character mid scene. Then the end comes and they just decide that they aren’t going to be together on the same Earth? WTF? This brings me to my final point. The CW is trying very hard to get across a few political messages. Whether you love or hate what is going on in the world, the last place I want to see politics is on a show I want to see. Television is supposed to be a relief from the corruption and political bullcrap that is our current real society. The constant push to make comments like “Make America Aryan again” just doesn’t bring anything to the show. And the primary focus to be on relationships that seem way more forced than natural (gay or straight) comes off as more a message than anything else. We will see how the rest of the individual shows work out when I do my review at the end of the seasons, but for this crossover it is one you can easily skip. I’ll give it 2 out of 5 sCrypt ratings, and that really comes down to a good concept and cool characters being screwed by poor writing and nonsense. What did you think of Crisis on Earth X? I’d love to hear if I’m the only one who felt this way or you agree. The CW network has really convinced me of quality programing in one of its shows (Arrow). 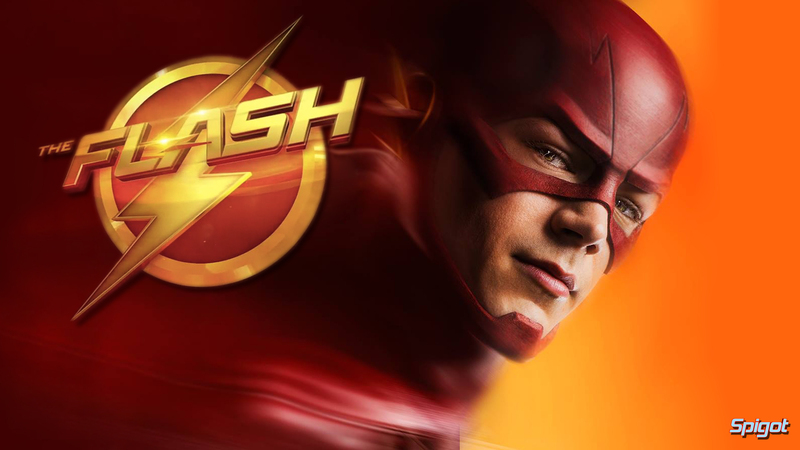 Now with the backdoor pilot set in the Arrow universe, Barry Allen will become the Flash in his own show. I was able to catch an early screening of the pilot that will air in the Fall, and let me say that it has already begun much better than most pilot episodes for a series. Here is my review with minor spoilers included. I will not spoil anything from the plot itself, so the spoilery info will be kept to the minimum. To cram all of this in 42 minutes is impressive when it doesn’t feel rushed. We have Barry’s lab accident that gives him superspeed. A reason for his suit to be what it is. His mother being murdered when he was a child, and you most certainly see the reverse flash (Professor Zoom) in the chaos that kills her. And a search for other meta-humans who have powers or abilities beyond normal. Oh, and we also have the Weather Wizard (kind of). Overall, it flowed well. Some of the dialogue was a bit cheesy in parts, and the easter eggs seemed forced, but it was pleasing above all else. Flash/Barry Allen: Grant Gustin IS Barry. His presence on screen, really personifies the role, and though I was skeptical at first, I’m convinced they made the right choice. I also really like how he analyzes the crime scene. It is a unique take on visually showing what he has in his mind. I hope we see a lot more of this. As far as the costume goes… I’m glad that they referenced it was a prototype design. This probably means that it will evolve over time. Iris West: Eventually Iris and Barry will be married (if we assume they follow the comics). Like any CW show however, they had to put in a different love interest to make it soap opera-y. That annoys me to a certain extent, and though I also hate when they change the race of a character, Candice Patton works well for this role. She’s attractive, and has great on screen chemistry with Gustin. Detective West: I’m hoping that they don’t make him another Detective Lance (from Arrow). It seems like they might be doing that a little bit, but since Barry is a cop, we have to have some sort of veteran on the job. He came off as a bit of a prick but in a good way. Caitlin Snow & Cisco Ramon: Their roles seemed to be placed forcefully into Barry’s life, but I think it will work. We already see a dark side to Caitlin (who in the comics becomes the villain, Killer Frost)… And Cisco has an overeager nerdy side, that you would only see in a protagonist character. He of course becomes (Vibe) in the comics, and of all the justice league characters I’m not sure why they’d choose him as a focal point, but I guess they are trying to push sales with that character. It’ll be interesting how their fates pan out. Dr. Harrison Wells: Speaking of fates…wow, what a twist at the end. All I’ll say is that his purpose is of a much grander scheme, and like Malcom Merlyn in Arrow, I think that he will serve a similar role. And not to say too much, but his name is not really Harrison Wells, but I’ll bet that wheelchair really moves fast and I wonder how much tech Star Labs has gotten from the future (Yes, you comic fans might know what I’m saying here). Henry Allen: Seeing John Wesley Ship in this role was awesome from the moment he appeared on screen. Sure it is minor, but I enjoyed the original live action Flash series in the nineties, so to see the original Barry Allen in a Flash series again is nice to see a passing of the torch in a way. I can’t wait to see what sort of person he will be as the series progresses. Eddie Thawne: Okay, so I originally thought this was Eobard Thawne (Professor Zoom) from the comics, but apparently he may be a great great ancestor or something. I’m not sure, but all I know is he will definitely be connected to the twist at the end of the pilot episode. It’ll be interesting to see his placement and purpose. Clyde Mardon: He’s the brother of the Weather Wizard (Mark Mardon), but exhibits the same powers. His role as villain of the week was only a minor part of the episode, but to see Barry racing against a tornado was pretty awesome. With him dead now, I am only assuming that his brother Mark will take over the role of the true Weather Wizard. The effects for the weather abilities looked pretty natural too, so it was quite welcome to see this. Some seemed forced, but here are the ones I caught… Caitlyn referenced something called the ATOM SMASHER… could this be a forshadowing to the character of the same name being on the series? Of course there were the ZOOM tributes and presence in the beginning and end… A cage in Star Labs was bent out of shape with a tag on it that said GRODD… I only assume that we will get Gorilla Grodd in the show at some point soon…. In the futuristic newspaper that was during the twist at the end, one of the headlines said “Waynetech and Queen Consolidated”… It talked about a merger between the two companies, which means that Bruce Wayne (hopefully Affleck) may appear in one of these two shows at some point. In the same paper, we also see a hint at Barry Allen’s fate during the Crisis. Could this 10 year forshadowing be a way of thinking ahead. Smallville ran for 10 years. If The Flash has the same strength in its legs, could we get a series finale with a crisis storyline? Or perhaps this could be tying in to the thoughts of a Justice League movie with similar plots? Finally, I had to include Oliver Queen/Green Arrow. It’s more of a cameo than an easter egg, but having him in it with words of encouragement for the new hero was really cool. I’m not sure about his swan dive over the edge at the end, but hell, it was awesome to see that they will maintain that crossing over to some effect. There are so many what ifs and what will happen running amok in my head right now as I still spin from a really delightful first episode. There are flaws in dialogue, but for a first episode, this really hit the ball out of the park. I’m going to give it an 8 out of 10 sCrypt Coffins. Did you see it? If so, what did you think? What are your speculations and hopes for this show? Comment below.